Now that we've learned all the basics behind the components in the SIK experiments, let's put them all together to make some fun. This circuit will show you how to create your own Simon Says game. 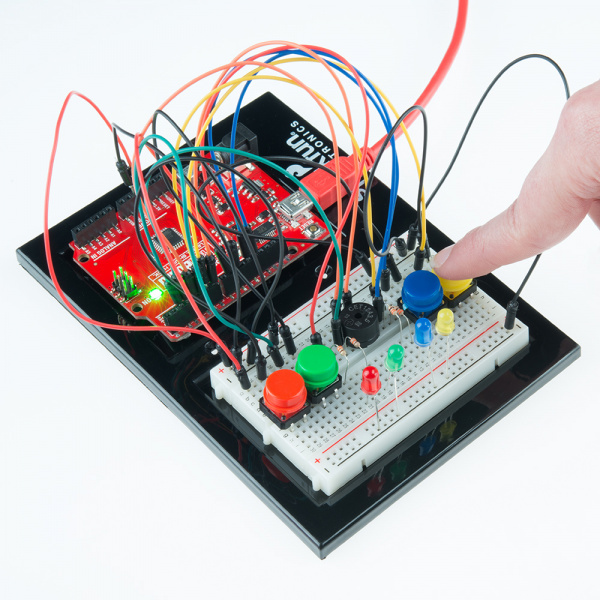 Using some LEDs, some buttons, a buzzer, and some resistors, you can create this and other exciting games with the RedBoard or Arduino Uno R3. 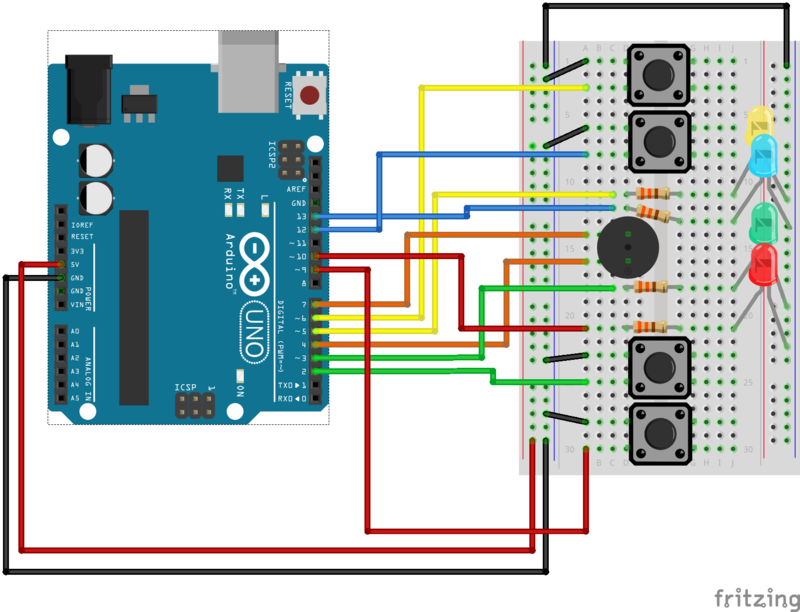 Open Up the Arduino IDE software on your computer. Coding in the Arduino language will control your circuit. Open the code for Circuit 16 by accessing the “SIK Guide Code” you downloaded and placed into your “Examples” folder earlier. Generates random sequence, plays music, and displays button lights. Simon Says game originally written in C for the PIC16F88. Ported for the ATmega168, then ATmega328, then Arduino 1.0. #define ROUNDS_TO_WIN      13 //Number of rounds to succesfully remember before you win. 13 is do-able. // That player repeats the button and adds one, then passes back. if (choice == 0) return false; // If wait timed out, player loses. if (choice != gameBoard[currentMove]) return false; // If the choice is incorect, player loses. // Toggle buzzer every buzz_delay_us, for a duration of buzz_length_ms. // Notes in the melody. Each note is about an 1/8th note, "0"s are rests. digitalWrite(BUZZER1, LOW); // setup the "BUZZER1" side of the buzzer to stay low, while we play the tone on the other pin. The #define statement is used to create constants in your code. Constants are variables that will likely only have one value during the lifespan of your code. Thus, you can assign constants a value, and then use them throughout your code wherever. Then, if you need to change that value, you can change that one line instead of going through all the code to find every instance of that variable. Bytes are another variable type. In the world of computing, a byte is a chunk of space that contains 8 bits, and a bit is a single binary value. Binary is another way of counting and uses only 1's and 0's. So a byte can hold all 1's: 11111111, all 0's: 00000000, or a combination of the two: 10010110. Once the code is uploaded, the buzzer will beep a few times, and all four LEDs should begin blinking. The game begins once you press any of the four buttons. Once the game has been started, a random LED will blink. Press the button associated with that color LED to replicate the pattern. With a successful guess, the pattern will repeat, this time adding another random LED. The player is to follow the pattern for as long as possible, with each successful guess resulting in an additional layer of complexity added to the original pattern. Toys and Games, such as the original Simon from Milton Bradley, have relied on electronics to provide fun and entertainment to children across the world. If only half of you circuit is working, make sure you added the additional wire from one ground rail to the other. Remember that breadboards have two power rails on each side and that these can be connected, or bussed, together to provide the power to both sides of the same circuit. Once the piezo buzzer is in the breadboard, it's hard to see the legs and to which row they are connected. If you aren't hearing any sound, make sure your wires are on the same row as the piezo buzzer legs. If everything starts up ok, but you're having trouble when it comes time to play the game, you may have a button or two misplaced. Pay close attention to which pin is connected to each button as it matters which button is pressed when a particular color lights up.